Both Obama and Romney have told us that they want to draw stark contrasts between themselves. They did a great job of just that this week. We saw an amazing contrast of arrogance and humility. Both men were invited to address the NAACP (the National Association of Colored People). Mitt Romney accepted, knowing that he faced a potentially hostile reception. Barrack Hussein Obama snubbed the organization, sending Vice President Bumbling Joe Biden in his place. The NAACP always invites the nominees of both major parties to its convention in election years. In the previous election cycle both John McCain and Obama spoke. But Obama has become so arrogant that he thinks he has the black vote in his pocket and does not need to show the NAACP any respect. It started out to be an even worse insult. Originally when Obama turned down the organizations invitation he offered to send Valerie Jarrett instead. Jarrett is a Chicago machine politician like her boss. She has the title of “Special Advisor” to Obama, but holds no cabinet level office. Sending a cabinet official in his place would have been insult enough, but to even think about sending a “Special Advisor”? Come on, Obama, I thought even you had more political savvy that that. So he decides to send Joe Biden, who is famous for his inability to open his mouth without sticking his foot in it. For heaven’s sake, Obama, the NAACP wanted to hear the vision of both candidates. They didn’t ask for the village idiot. Predictably, the mainstream media has jumped to the defense of their boy. “Obama is so busy being president, he doesn’t have time to accept every speaking engagement. Balderdash! He made time to do 30 fundraisers in June. He makes time to schmooze every Wall Street big money donor that knocks on his door. Why couldn’t he make time for the people that got him elected? Without the black vote Obama would be just another US Senator today. It’s simple. He is so arrogantly confident that blacks will vote for him no matter what he does that he feels that he takes no risk by insulting them. Black pastors are very angry with him over his support for homosexual marriage. These pastors are the strongest influencers of opinion in the black community. And as I mentioned in my article last week, unemployment among blacks is 50% higher than the general population. Among black youth it is FIVE TIMES higher than the national rate. 73% of black children are born out of wedlock, many to mothers who are children themselves. In addition, in many inner city schools the dropout rate is well over 50%. Yet Obama just exempted his 25th state from the requirement to comply with the No Child Left Behind mandates. President Bush began the program to combat “the soft bigotry of low expectations” of minority children. I believe Obama has sabotaged the program by exempting half the nation from its requirements only because Bush started it. While I don’t believe that federal regulation of education is the answer to the problem, it is hypocritical of Obama, (who believes government should control everything) to crush a program designed to help black children. Obama also revoked the school voucher program in Washington, DC, angering many black families. DC’s schools are among the most dangerous in the nation, and they are notorious for their inferior quality. These parents had been able to send their children to safe, quality schools for the first time because of the vouchers, and Obama took that away. Black leaders have been bringing up these issues for over a year, as the love affair of African Americans with the so-called “First Black President” has waned. Unlike Obama, Romney accepted the NAACP’s invitation. That took guts. It was tantamount to Obama speaking to the NRA, something he would never have the courage to do. Mitt Romney’s speech was a gracious contrast to Obama’s insult. He endured some booing early on when he mentioned ObamaCare. Instead of showing displeasure as the very thin-skinned Obama has often done, Romney thanked the group for their hospitality. This was a gentle reminder that they had invited him to speak, and that it is not polite to boo a guest. He then proceeded to explain in clear terms his vision for the economy and job creation. When he explained how ObamaCare has cost jobs and will continue to do so if it is fully implemented, he got some polite applause. He did such a good job of articulating his positions (without being condescending as Obama often is) that he received a standing ovation. What does all this mean? Are blacks going to vote 95% for Romney as they did for Obama in the last election? Of course not. In 2008 millions of blacks admitted that they voted for Obama because he was half black. It was their right to do that, and many of them will do so again. But there has been a rising chorus of black leaders who have been stating that Obama has done nothing for blacks, and in fact has hurt them. He is losing black votes without any help from Romney, and I predict that his percentage of votes from African Americans will be much lower in this election. But now there is another factor to consider. 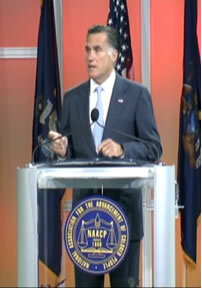 Mitt Romney acquitted himself very well in his speech before the NAACP. He was gracious, but firm. He didn’t pander to his audience as Obama does. When Obama speaks to any group he tailors his remarks to what they want to hear. And he always promises them some kind of giveaway, whether it is support for the homosexual agenda, promises to protect unions from open votes, or special tax breaks for the group he is addressing. Romney could easily have avoided any mention of ObamaCare. He could have just said that he will eliminate wasteful government spending without mentioning the budget busting program by name. But he is a man of character, so he spoke about the same things he always does, and explained why ObamaCare would hurt the people at the convention financially and make it even harder for them to find jobs. This gained him respect from the NAACP, whose spokesperson called Romney “courageous” for coming to speak to them. The attendees echoed this sentiment, with many of telling reporters that he had made good points. And a surprising number of them said that they were now considering voting for Romney. What do you want to bet that Obama is experiencing major heartburn right about now?